Maps are usually made by conquerors. This is an exception: it was made by the side that lost. 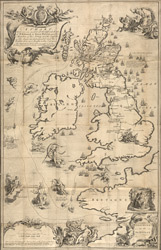 The map was drawn by James Grant, a French officer of Scottish descent who fought alongside Bonnie Prince Charlie throughout his campaigns, including the Battle of Culloden, and accompanied him on his flight to France. The map bears the royal arms of the Stuart kings and records in detail the battles and sieges of the Jacobite campaign. Allegorical figures, such as Justice, dignify the conflict. The Prince’s escape route is watched over from the clouds by the gods of classical mythology: Venus, Zephyr, Apollo, Mercury and Neptune. In a rebuttal of the English propaganda that followed the defeat of the Jacobite Uprising, the map is pointedly “Inscrib’d to all the Honest”.